Why is Carpet Mold Difficult to Detect? Mold growth can happen anywhere in a home where moisture and biological material is present. This can occur in many locations in a typical home, but one of the most common locations is on or underneath wall to wall carpet. Carpet is also one of the most common locations where mold can grow and go unnoticed to occupants, or poorly trained professional contractors. Carpet mold can be present in your home without you even noticing until the health problems associated with mold become dire. If your home is carpeted, this should be a special consideration if you are experiencing respiratory or other health problems. Working with a professional mold inspector is the only sure way to make sure the comfort of wall to wall carpet doesn’t come at a price to your health. Mold can be a dangerous presence in your home. Some molds may be more dangerous than others, and some people may be more prone to have adverse reactions or symptoms in the presence of mold. However, all molds pose a threat to the health of home occupants through the release of spores and other dangerous bioaerosols. Bioaerosols are toxins and other particles that can become airborne as the result of mold growth. These dangerous airborne substances can cause respiratory inflammation and exacerbate existing respiratory problems such as asthma or infection, and this poses an especially dangerous risk to infants, the elderly, and those with compromised immune systems. The CDC does not consider any amount or type of mold growth in the home safe and recommends that any building material contaminated with mold be removed from the home immediately. To understand why carpet can be one of the biggest harborers of mold, we have to understand how carpet is installed and what lies beneath. A carpet floor generally consists of three layers: a subfloor, a carpet pad, and the carpeting itself. The carpet is usually installed with tack strips around the perimeter of the room. The subfloor is the structural floor beneath the carpet installation. The subfloor could be several different materials. If your home is built with a “slab-on-grade” design, the subfloor is most likely concrete on the first floor. Similarly, the subfloor is likely concrete in a basement room. Concrete itself is not affected by moisture and cannot, on its own, become food for mold growth. However, concrete is porous, and is generally in direct contact with the earth. Without a sound moisture barrier and proper drainage around the structure, concrete can absorb moisture and therefore allow it to seep up through the subfloor into the building. This can take the form of bulk water but can also be water vapor evaporating up through the slab, increasing humidity or condensing on surfaces inside. This moisture can be chronic or occasional, fluctuating with ground moisture surrounding the building. Carpeting installed over concrete that has moisture infiltration can trap this moisture, supporting mold growth on the carpet, pad, or tack strips. Any wood subfloor laid on top of the concrete and underneath carpeting can also support mold growth. If your home has a floor suspended over a basement or crawl space, or on upper levels in the home, the subfloor is most likely wood. Older homes may have a subfloor made of solid “one by” lumber material. Newer homes have subfloors of plywood or OSB “chipboard”. All types of wood subfloors may harbor and feed mold growth in the presence of moisture. Moisture can come from a variety of sources- ground water vapor, leaks around sinks or inside walls, frequent spills or humid areas, such as inside or just outside a bathroom. Even water from roof leaks can run down plumbing or walls and end up wetting a floor. There is yet another possible type of subflooring, and that is an older floor covering. When wall to wall carpet became popular, one big selling point was that it was easy to install over existing floors, such as linoleum, tile, or hardwood. Millions of homes across the country have carpet hiding an old flooring underneath. Different types of flooring may pose varying risk to mold growth under carpet. Whether a substrate is organic, and whether it absorbs and holds moisture will affect the extent to which it can contribute to mold growth. The next layer is the carpet pad. The carpet pad serves to cushion the carpet underfoot. Carpet pads are generally made of recycled polyurethane foam glued to a lightweight netting. Carpet pad is literally a sponge. When wetted, it readily absorbs water and then holds it, creating a perfect environment for mold. Some carpet pads will be more resistant to mold than others- organic glues and other materials in carpet pad can feed mold, but the main contributing factor of the pad is its propensity for absorbing water and holding it to feed mold on adjacent surfaces. Also lying below the carpet are the tack strips around the perimeter. Made from wood, these can also absorb water and harbor mold. The final layer of the carpet installation is the carpet itself. Similar to the pad, carpeting may have varying contributing characteristics in regard to mold growth, depending on materials and construction. Also similar to carpet pad, carpet absorbs water, which can trap and hold water to hydrate mold spores. But one of the most diabolical characteristics of carpet is its ability to hide what’s beneath- as moisture evaporates up through the fibers of carpet, it is able to evaporate quickly from the top of the carpet fibers, while below in the carpet backing and pad, water is trapped. While the carpet surface feels dry, water can still be fueling mold growth under the surface. 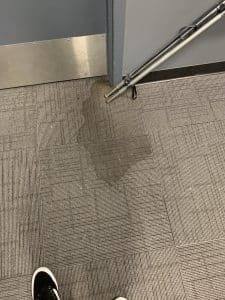 When carpet gets wet, weather it happens as the result of a one-time flood, or as the result of a chronic water vapor or humidity issue, the danger of carpet is that water can collect below the surface of carpet, and may linger for weeks while the carpet seems already dry from above. Once mold it established, it will always pose a health threat, even if the mold eventually dries out and stops growing. Bioaerosols and spores will move up through the surface of the carpet and affect indoor air quality until the mold is discovered and remediation is complete. How can mold be detected in carpet? An experienced and well-equipped mold inspector can determine if or where mold may hide throughout a home, including in wall to wall carpeting. With advanced detectors, tests and equipment, a professional mold inspector can determine if mold or moisture is present in the home and whether indoor air quality is dangerous as a result. While the danger of mold in carpet and elsewhere in the home can be frightening, an easy appointment with a mold inspection professional can determine with certainty if mold is an issue in your home, and if it is, set you on the right track to provide a healthy environment for you and your family.